Cancer is a heartbreaking disease for all involved. A once fit and healthy person becomes debilitated by this terrible illness and their loved ones have to stand by and watch. So the thought of someone pretending to have cancer is completely incomprehensible to me. But that’s allegedly what one woman in Queensland has done. Lucy Wieland, a 27-year-old from Townsville, has appeared in court today (October 18), charged with fraudulently raising money on a fundraising page on which she told people she had terminal cancer. According to ABC, Townsville Magistrates Court heard Wieland created an allegedly ‘fictional journey through stage five ovarian cancer treatment’. 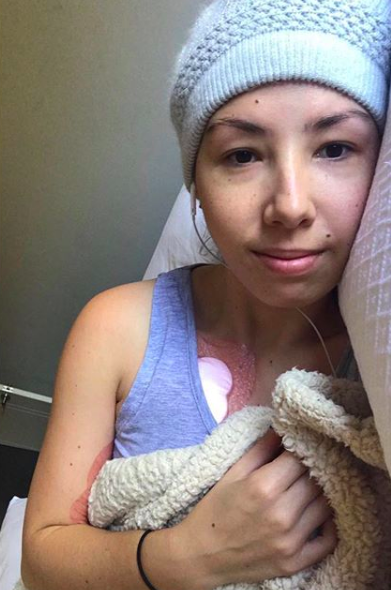 She did this through her Instagram, where she told her 900+ followers about her diagnosis and led them through her ‘treatment process’. In one such post, Wieland spoke about how she needed a walking stick to aid her movement, as the pain caused by her ‘terminal illness’ was too much to ignore. Police have alleged Ms Wieland set up a fundraising page that raised $55,000 (approximately £41,000), after telling the community she could not cope with the financial burden caused by the illness. Detective Inspector Chris Lawson addressed the crowd outside court, saying Wieland was arrested on Wednesday (October 17) after a month-long investigation. Some people in the community identified some problems with the story and we conducted investigations to establish the veracity of the claims made by this woman. It’s disheartening, I mean the real victims here are the people from the community that have heard the stories, have tried to assist as best they can and in some cases what little they have and given the money across in the honest belief they are trying to help people. Wieland has not posted on her Instagram account in the past six days, the last image uploaded being one of two hands holding onto each other. Comments on the post were initially supportive, with her followers wishing her well in her journey and sending her love. However, since she appeared in court the only comments are those expressing their disgust at what she has allegedly done. DISGUSTING Adjective. 1. causing disgust; offensive to the physical, moral, or aesthetic taste. Cannot believe you have done this. How did you get up everyday knowing you were ripping people off! People who genuinely wanted to help you!!! I hope you go to jail for a very long time, that way you will be able to think about what you have done! Wieland has been granted bail, with Magistrate Steven Mosh saying that while it was ‘an extraordinary set of circumstances’, the 27-year-old had no criminal history therefore the risk to the community would be minimal. Police prosecutor Rachel Todd opposed bail for Wieland, saying she had significantly breached the community’s trust. Ms Todd said a ‘large amount of effort and complexity’ had been put into the alleged ruse. Wieland is due in court again in December.